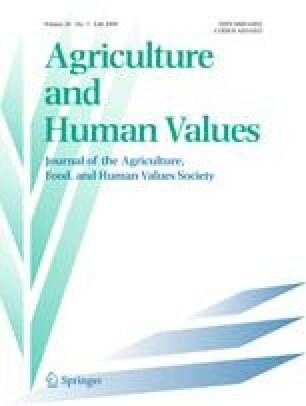 This paper focuses on examining the dynamic nature of community supported agriculture (CSA) and the real-world experiences which mark its contours, often making it distinct from the early idealized CSA “model.” Specifically, our study examines the narratives of the farmers of Devon Acres CSA over its duration, in tandem with a survey of recent shareholders in order to understand and explain its evolution. The framework we develop here shows that this CSA is largely characterized by instrumental and functional beliefs and practices, with some elements in the collaborative mode. A key contribution of this research is the development of a framework which helps to highlight the relative fluidity and patchwork quality of CSA participant positions over time. At Devon Acres, the real-world factors and issues influencing CSA evolution are seen to be products of both the local and larger contexts, evident in such areas as shifts in farmer learning and adaptation, differences between beliefs and practices in member volunteer efforts, and changes in farm and resource conditions. With respect to CSA more broadly, we argue that the reality of dominant food system context and site-specific influences on CSA development compels us to rework our attachment to early idealized “model” traits. Expansion in CSA numbers, evidence of adaptation and situated learning, and retention of the local and organic as core traits, speak to the pragmatic yet transformative potential of CSA contribution to food system change. Local Harvest. 2008. Community supported agriculture. http://www.localharvest.org/csa.jsp. Accessed 20 February 2008. McFadden, S. 2004. The history of community supported agriculture part II: CSA’s world of possibilities. http://www.newfarm.org/features/0204/csa2/part2.shtml. Accessed 28 January 2008. Robyn Van En Center. 2006. Community supported agriculture. http://www.wilson.edu/wilson/asp/content.asp?id=804. Accessed 28 August 2006.